"Along with spirituality, we focus on family, education, community, government and entrepreneurship"
A group of aspiring future leaders up to age 21 who have decided to serve God and show others the fun they have while doing so! Our NuGen Youth gather every Sunday at 9:30AM and 11AM and each Wednesday at 7:00PM for an autonomous time of connecting and fellowship. A program that teaches youth how to resolve conflict in a peaceful manner, without violence. Partnered with the Chicago Bar Association, GBM leads Restorative Justice Programs in Chicago Public, Private and Suburban Schools. LATEST SERMON! CLICK TO SEE! GBM provides spiritual, emotional, educational, economical and life-related supports to those from foreign lands who make America their home. 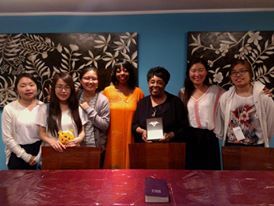 GBM exposes NuGen Youth to different cultures and languages and provides guidance to equip them and other individuals to serve in different mission fields (South Korea, Nigeria, America, China).